How to create profile in Odesk? Today in the world of the freelance one of the best platform is Odesk. They hire talented people, manage and pay for the work. Odesk is a global service marketplace for everyone. I think it is a very good for starting online work. You can take it as a profession. You can earn money without investment from here. If you tried a little bit then you can earn handsome money. There are so many works, select one of them which is the easiest for you. But the question is that how you start the work? You know the work but how you get the work? What is the guarantee? No problem I will tell you the way step by step. Now the question is what is Odesk? Odesk is the one of biggest freelancing platforms for starting a freelancing career. Odesk helps the freelancer to get the work and also help the buyer. First you have to create a profile in Odesk but how you create the profile? How you create 100% of your profile? Create your email account and then sign up in Odesk. There is a form, fill it. 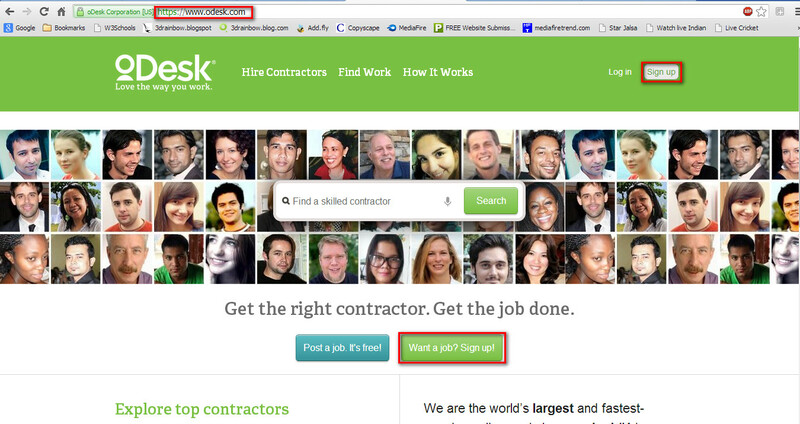 Go to Odesk and sign up there with selecting “I need a job” option. Then select “Get started” option. They will send a verification email to your account. Just verify the account and your account is ready.